Use this topic to learn the basic concepts of CSS such as CSS rules, selectors, inheritance, and more. Also, learn how to associate CSS with your web pages in Dreamweaver. Cascading Style Sheets (CSS) is a collection of formatting rules that control the appearance of content in a web page. Using CSS styles to format a page separates content from presentation. The content of your page—the HTML code—resides in the HTML file, and the CSS rules defining the presentation of the code reside in another file (an external style sheet) or in another part of the HTML document (usually the head section). Separating content from presentation makes it much easier to maintain the appearance of your site from a central location because you don’t need to update every property on every page whenever you want to make a change. Separating content from presentation also results in simpler and cleaner HTML code, which provides shorter browser loading times, and simplifies navigation for people with accessibility issues (for example, those using screen readers). CSS gives you great flexibility and control over the exact appearance of your page. With CSS you can control many text properties including specific fonts and font sizes; bold, italics, underlining, and text shadows; text color and background color; link color and link underlining; and much more. By using CSS to control your fonts, you can also ensure a more consistent treatment of your page layout and appearance in multiple browsers. In addition to text formatting, you can use CSS to control the format and positioning of block-level elements in a web page. A block-level element is a standalone piece of content, usually separated by a new line in the HTML, and visually formatted as a block. For example, h1 tags, p tags, and div tags all produce block-level elements on a web page. You can set margins and borders for block-level elements, position them in a specific location, add background color to them, float text around them, and so on. Manipulating block-level elements is in essence the way you lay out pages with CSS. An individual declaration consists of two parts, the property (such as font-family) and value (such as Helvetica). In the previous CSS rule, a particular style has been created for h1 tags: the text for all h1 tags linked to this style will be 16 pixels in size, Helvetica font, and bold. The style (which comes from a rule, or a collection of rules) resides in a place separate from the actual text it’s formatting—usually in an external style sheet, or in the head portion of an HTML document. Thus, one rule for h1 tags can apply to many tags at once (and in the case of external style sheets, the rule can apply to many tags at once on many different pages). In this way, CSS provides extremely easy update capability. When you update a CSS rule in one place, the formatting of all the elements that use the defined style are automatically updated to the new style. Class styles let you apply style properties to any element or elements on the page. HTML tag styles redefine the formatting for a particular tag, such as h1. When you create or change a CSS style for the h1 tag, all text formatted with the h1 tag is immediately updated. Advanced styles redefine the formatting for a particular combination of elements, or for other selector forms as allowed by CSS (for example, the selector td h2 applies whenever an h2 header appears inside a table cell.) Advanced styles can also redefine the formatting for tags that contain a specific id attribute (for example, the styles defined by #myStyle apply to all tags that contain the attribute-value pair id="myStyle"). Collections of CSS rules stored in a separate, external CSS (.css) file (not an HTML file). This file is linked to one or more pages in a website using a link or an @import rule in the head section of a document. Collections of CSS rules included in a style tag in the head portion of an HTML document. Dreamweaver recognizes styles defined in existing documents as long as they conform to CSS style guidelines. Dreamweaver also renders most applied styles directly in Design view. (Previewing the document in a browser window, however, gives you the most accurate “live” rendering of the page.) Some CSS styles are rendered differently in Microsoft Internet Explorer, Netscape, Opera, Apple Safari, or other browsers, and some are not currently supported by any browser. The term cascading refers to the way a browser ultimately displays styles for specific elements on a web page. Three different sources are responsible for the styles you see on a web page: the style sheet created by the author of the page, the user’s customized style selections (if any), and the default styles of the browser itself. The previous topics describe creating styles for a web page as the author of both the web page and the style sheet attached to that page. But browsers also have their own default style sheets that dictate the rendering of web pages, and in addition to that, users can customize their browsers by making selections that adjust the display of web pages. The final appearance of a web page is the result of the rules of all three of these sources coming together (or “cascading”) to render the web page in an optimal way. A common tag—the paragraph tag, or <p> tag—illustrates the concept. By default, browsers come with style sheets that define the font and font size for paragraph text (that is, text that falls between <p> tags in the HTML code). In Internet Explorer, for example, all body text, including paragraph text, displays in Times New Roman, Medium font by default. When a user loads the page, the paragraph font and font size settings set by you as the author override the default paragraph text settings of the browser. Users can make selections to customize the browser display in an optimal way for their own use. In Internet Explorer, for example, the user can select View > Text Size > Largest to expand the page font to a more readable size if they think the font is too small. Ultimately (at least in this case), the user’s selection overrides both the default browser styles for paragraph font size and the paragraph styles created by the author of the web page. All body text will be Arial and italic except paragraph (and its inherited) text, which will display as Courier normal (non-italic). Technically, the paragraph tag first inherits the properties that are set for the body tag, but then ignores those properties because it has properties of its own defined. In other words, while page elements generally inherit properties from above, the direct application of a property to a tag always causes an override of the standard formula for inheritance. The combination of all of the factors discussed above, plus other factors like CSS specificity (a system that gives different weight to particular kinds of CSS rules), and the order of CSS rules, ultimately create a complex cascade where items with higher priorities override properties that have lower priorities. For more information on the rules governing the cascade, inheritance, and specificity, visit www.w3.org/TR/CSS2/cascade.html. By default, Dreamweaver uses Cascading Style Sheets (CSS) to format text. The styles that you apply to text using the Property inspector or menu commands create CSS rules that are embedded in the head of the current document. You can also use the CSS Designer to create and edit CSS rules and properties. The CSS Designer is a much more robust editor than the Property inspector, and displays all CSS rules defined for the current document, whether those rules are embedded in the head of the document or in an external style sheet. Adobe recommends that you use the CSS Designer (rather than the Property inspector) as the primary tool for creating and editing your CSS. As a result, your code will be cleaner and easier to maintain. 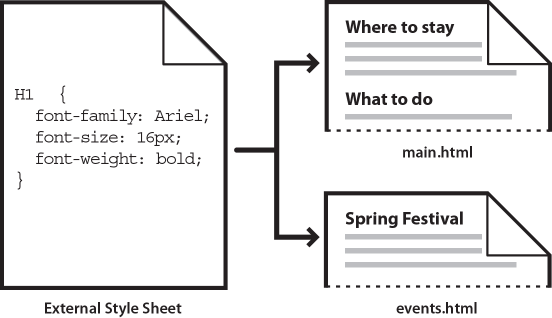 For more information on CSS Designer, see Laying out pages using CSS Designer. In addition to styles and style sheets you create, you can use style sheets that come with Dreamweaver to apply styles to your documents. For a tutorial about formatting text with CSS, see www.adobe.com/go/vid0153. The CSS specification allows for the creation of styles using an abbreviated syntax known as shorthand CSS. Shorthand CSS lets you specify the values of several properties using a single declaration. For example, the font property lets you set font-style, font-variant, font-weight, font-size, line-height, and font-family properties on a single line. A key issue to note when using shorthand CSS, is that values omitted from a shorthand CSS property are assigned their default value. This may cause pages to be incorrectly displayed when two or more CSS rules are assigned to the same tag. For example, the h1 rule shown below uses longhand CSS syntax. Note that the font-variant, font-stretch, font-size-adjust, and font-style properties have been assigned their default values. When written using shorthand notation, omitted values are automatically assigned their default values. Thus, the previous shorthand example omits the font-variant, font-style, font-stretch, and font-size-adjust tags. If you have styles defined in more than one location (for example, both embedded in an HTML page and imported from an external style sheet) using both the short and long forms of CSS syntax, be aware that omitted properties in a shorthand rule may override (or cascade) properties that are explicitly set in another rule. For this reason, Dreamweaver uses the long form of CSS notation by default. This prevents possible problems caused by a shorthand rule overriding a longhand rule. If you open a web page that was coded with shorthand CSS notation in Dreamweaver, be aware that Dreamweaver will create any new CSS rules using the longhand form. You can specify how Dreamweaver creates and edits CSS rules by changing the CSS editing preferences in the CSS Styles category of the Preferences dialog box (Edit > Preferences in Windows; Dreamweaver > Preferences on the Macintosh). You can use the CSS Designer to build your CSS with minimal coding. For more information, see Laying out pages using CSS Designer. You can also code your CSS by hand. For more information on coding features offered by Dreamweaver, see Coding environment in Dreamweaver. If you prefer to work with Sass, Scss, or Less files, you can code your files using your preferred syntax and use it in Dreamweaver. For more information, see CSS preprocessors.